A few weeks ago, I received an email from my employer. 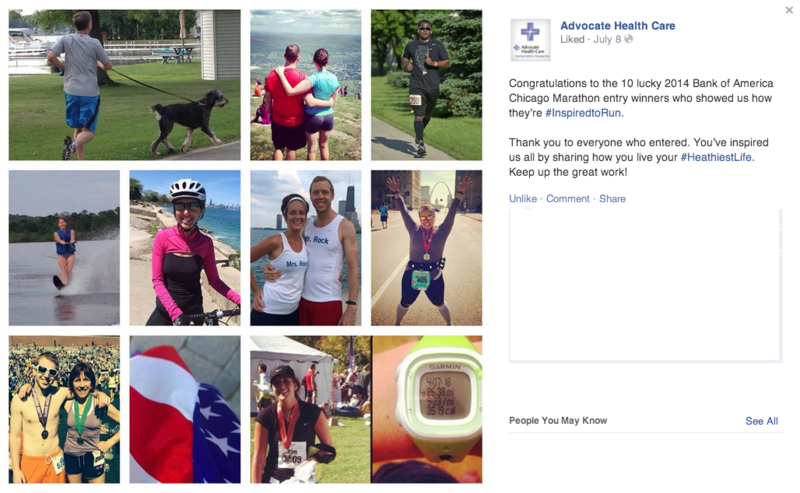 They were giving away 10 free entries to the Chicago Marathon. All I had to do was post a picture of myself doing something active on Instagram and tag it with #inspiredtorun and #healthiestlife. because waterskiing is cross training, right? ...and forgot about it. Until last week, when one of my coworkers posted a picture of the Fitbit she had won through the contest. I figured that I didn't win, felt briefly sad, but then started to think about next year. I started looking ahead to spring and fall marathons. I even talked about it with my trainer. 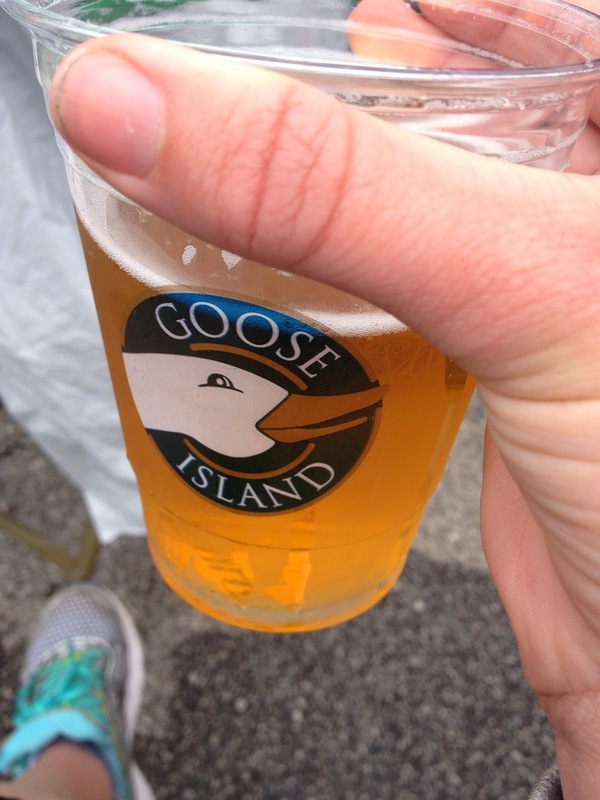 Quietly, I was actually making the decision to run a second marathon. Who's that waterskiier? My heart started to pound and I couldn't breathe. I had to read the caption multiple times. Because guess who won? Besides 9 other people? Yep, me! My husband asked me what was wrong. I must have been gasping for air. Shocked. And also, I never win anything! Well, anything big, that is! I told my husband and he came over to look. "You don't have to run it, you know," he said. I explained my logic to him. But instead of discouraging me, like he did when I signed up in 2011, he told me that was fine. Then he asked me what the entry fee was, I told him. $185. "Nice," he said. Pretty good prize, I think! Ok, so that hurdle was cleared. That night, I couldn't sleep. My mind just swirled with thoughts:... marathon training already started 2 weeks ago...I'm behind in my training...no I'm not, because I already have a strong base (minus the 4 weeks I took off for my injury)...how am I going to train for this? While Hal Higdon's novice 2 plan trained me adequately for the marathon, the high mileage took a toll on my body. In the past, Becky told me she could train me for another marathon, and my longest run would be 16 miles. Oh, so appealing. I get to run the marathon for free! And so it went. Flight of ideas...isn't that a psychiatric diagnosis? 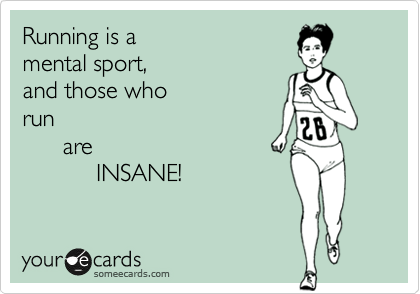 Aren't we runners all crazy? Maybe some of us more than others. Today I went for my weekly CF training with Becky. We were wrapping up our 6 week heavy lifting and in between deadlifts, we talked about my training. Basically it boils down to this: less running, more lifting/intervals/HIIT. She'd like me to come more than once/week to work with her. I think it will be worth it. I tried conventional marathon training for my last marathon, and you can read about that outcome here. I'm not saying it was the training. Certainly up until my 20 miler, I felt well prepared physically. My 20 miler went off without a hitch in 3:18. But the day of the race? It was 80 degrees and sunny. My nerves were frazzled. And I fell apart. I've done the race before and I know what to expect--the course, the crowds. This time will be different though. I'm stronger than I was 3 years ago--physically and mentally. I have the support not only of my family and friends, but of my circle of running friends, none of whom I knew before. They'll all be there because they are running it too. And I have a trainer who believes in me and believes strongly in what she's doing. Marathon training should not be one size fits all. But that's what these training plans are. There's no science behind them--they're written by runners who have run marathons and found a formula that works for them. And a lot of marathoners don't have the miles on their legs and feet that I do. I've been running for almost 25 years. That's a lot of wear and tear! If there's a way I can get to that finish line without breaking down my body, let's do it. I'm a little confused about the flag picture but hey, it won! Woot for the win! Definitely meant to be. As I told you before I am all for unconventional. Many roads lead to a strong marathon! Yeah what's up with that flag?? My biggest obstacle will be my nerves. Any suggestions with that? Wow congrats! So exciting. 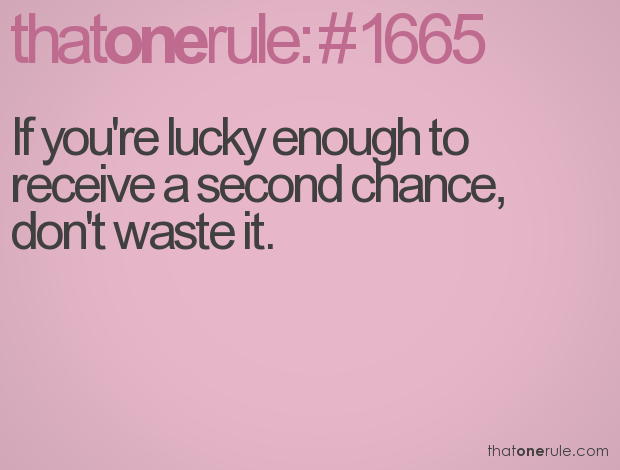 Maybe it's better not to agonize over a decision! I completely agree! I think this was the best outcome. Rock on, Girlfriend! I am so excited for you!!!!! In the words of our favorite vrb, yikes!!! WOHOOOO congrats!! I definitely want to do that race at some point. I think with your base you are totally fine and can jump in to a plan a little later. I'm really excited this time around! Wow! How exciting!! I wish I was going to be there running it with you ladies! You are going to do great! !